"Pretty much anything Netwrix ever put out is an example of a product that truly delights me. Their products just work. Plus, they are simple to get going relative to their value." 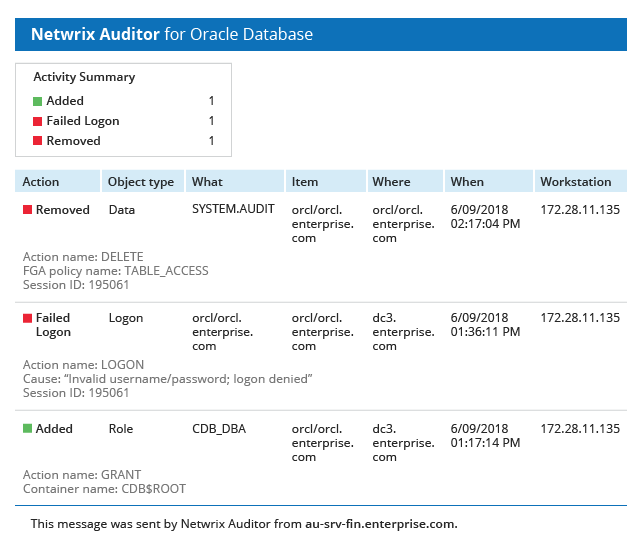 The free edition of Netwrix Auditor for Oracle Database keeps you on top of what’s going on inside your database server by reporting on all changes and access events, such as privilege modifications and failed connection attempts. This free Oracle Database monitoring tool sends daily reports that detail every event during the last 24 hours, including the before and after values for each change. Reports on successful and failed logons and shows which database objects were added, modified or removed, with the current and past values. Collects and aggregates data about user activity from multiple sources and automatically reports on it by email on a daily basis. Eliminates the need to analyze mountains of native logs by providing information about every change and access event in a human-readable format. Relieves you from painful budget approvals and extra expenses, saves you time on daily tasks, and will never expire or stop working when you need it. The analysis of native logs can be a nightmare for database administrators because of their volume, the number of SQL statements each log contains and their proprietary format. Finding a specific event can be like looking for a needle in a haystack. Unlike other free Oracle tools, the Netwrix database monitoring solution tracks user activity and provides an actionable, noise-free report each day, making it easy to spot and remediate unwanted actions and thereby minimize database downtime. The free edition of Netwrix Auditor for Oracle Database tracks all user activity, whether the action was made via Oracle SQL Developer, directly on the server or via an end-user application, and provides all the critical details. It never degrades database performance or cause CPU issues because it is agentless, which is crucial for high availability of mission-critical applications and services. "We don't like vendors; we like partnerships. Netwrix has virtually become part of our staff. With Netwrix Auditor, our IT team gets back valuable time, which makes our organization more efficient in accomplishing our goals for the county." Netwrix Auditor for Oracle Database is easy to deploy and manage. Check out the table below to make sure your IT infrastructure meets the minimum system requirements.